Reading and share top 12 famous quotes and sayings about Forgive But Never Forget by famous authors and people. 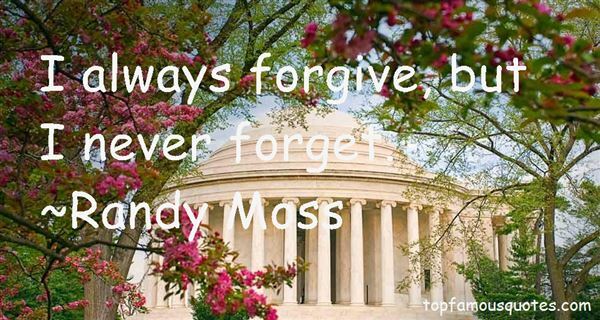 Browse top 12 famous quotes and sayings about Forgive But Never Forget by most favorite authors. 1. "The key is to forgive and let go of the hate, but never forget. Never forget so that you can protect yourself in the future. We can't always avoid everything and everyone who would hurt us--for that would be avoiding life. 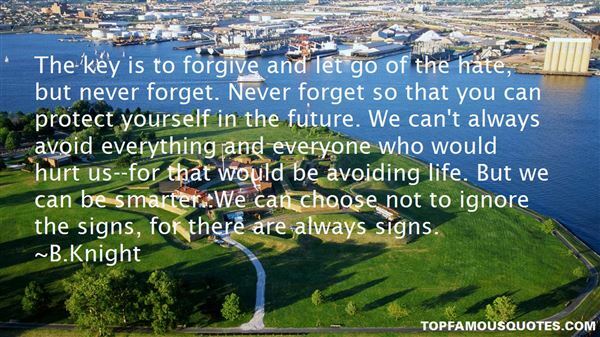 But we can be smarter..We can choose not to ignore the signs, for there are always signs." 2. "You have to take the good with the bad, smile with the sad. love what you got, and remember what you had. Always forgive, but never forget, learn from your mistakes but never regret. People change, things go wrong, but just remember life goes on." 3. "In my eyes you're perfect, until you lie to me. Betraying my trust is something I can forgive, but never forget. Stay perfect." 4. "Oh! in his rapture he was weeping even over those stars, which were shining to him from the abyss of space, and "he was not ashamed of that ecstasy." There seemed to be threads from all those innumerable worlds of God, linking his soul to them, and it was trembling all over "in contact with other worlds." He longed to forgive everyone and for everything, and to beg forgiveness. Oh, not for himself, but for all men, for all and for everything. "And others are praying for me too," echoed again in his soul. But with every instant he felt clearly and, as it were, tangibly, that something firm and unshakable as that vault of heaven had entered into his soul. It was as though some idea had seized the sovereignty of his mind -- and it was for all his life and for ever and ever. He had fallen on the earth a weak boy, but he rose up a resolute champion, and he knew and felt it suddenly at the very moment of his ecstasy. And never, never, his life long, could Alyosha forget that minute." 5. "He looked at her face and hesitated. He looked up at the canyon walls. Here on the sandbar, it was eerily quiet except for the tinkle of water over the rocks. A large bird made lazy soaring circles way up in the sky, almost invisible due to the angle of the sun. God forgive me, he thought. Then he touched Ranjit's lighter to the small sheaf of dried grass and threw it on the pyre. He was surprised at the flash when it caught fire. It wouldn't be long, he thought. I will move on, but I will never forget this place. (from The Sacrament of the Goddess)"
6. "Forgive your enemies, but never forget their names." 7. "John F. Kennedy says: ‘Forgive your enemies, but never forget their names.' I suggest that forgive your enemies and forget their names too! Don't leave any stone in your head; keep only the flowers, only the names of the good men!" 8. "I always forgive, but I never forget." 9. "Men forget, but never forgive; women forgive, but never forget.-Thom Merrilin"
10. "Forgive but never forget"
11. "Everything will usually get worse before it gets better, but when it does get better...remember all who put you down and all who helped you up. Forgive but never forget. 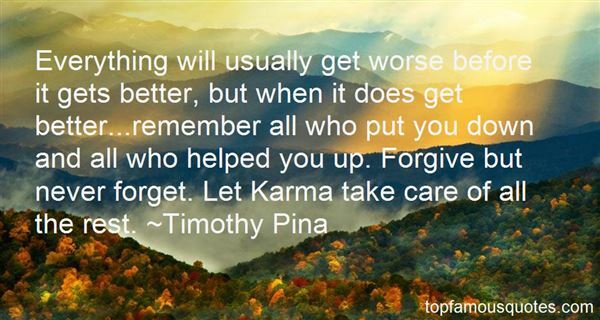 Let Karma take care of all the rest." 12. "Always forgive, but never forget, else you will be a prisoner of your own hatred, and doomed to repeat your mistakes forever." From the mud of adversity grows the lotus of joy"